All the major players participating in Saturday’s “UFC 125: Resolution” extravaganza will be hitting the podium today inside MGM Grand Hotel Lobby in Las Vegas, Nevada. Stream Wednesday’s pre-fight press conference live right here on 5thRound.com starting at 1PM PT/4PM ET. 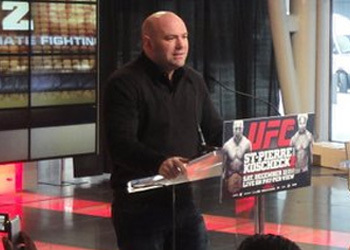 In addition to UFC president Dana White, all the athletes participating in the pay-per-view portion of the event are expected to attend the presser. Lightweight champion Frankie Edgar puts his title on the line against Gray Maynard in Saturday night’s featured attraction.